Earlier this week, we held the second class of Markets, Design and the City. The class focused on the data that is so important to urban planning, with Alain’s extensive experience providing important perspective. Years ago, expensive paper maps were the best sources of information, and Alain remembers needing to adjust the scale to account for the paper expanding during monsoon seasons while working in Asia. Today, an influx of data has transformed the planning profession. For example, anyone may now download Google Earth Pro, a powerful mapping tool, for free. However, all too often planners do not use data judiciously, as evidenced by master plans that now run hundreds of pages long with appendices full of data. Alain contends that every piece of data should have a clear meaning and purpose for the master plan. Data that is simply “interesting” should not be included in such a document. The class focused on a particularly important piece of information: population density. 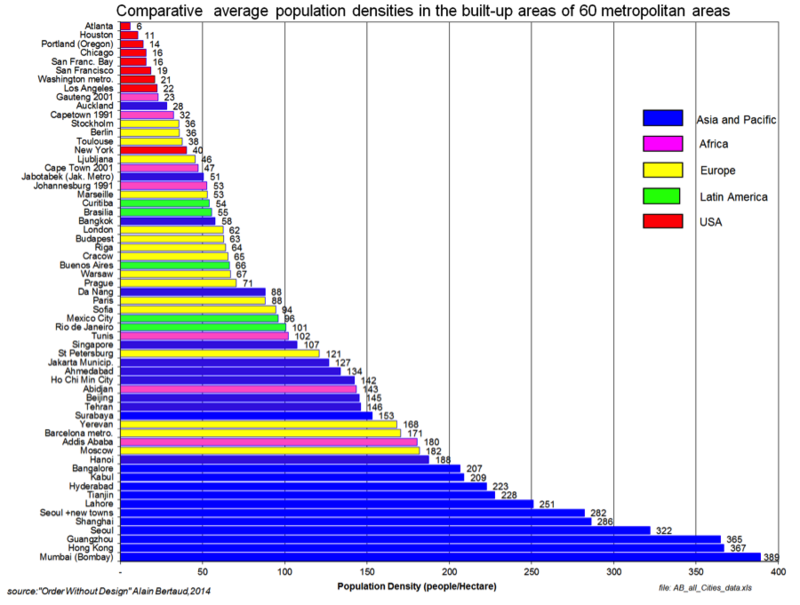 Densities are often difficult to understand and compare because they are measured differently by different people. Beijing, for example, is often cited as having a very low density, but this is because Beijing’s administrative boundaries include a large amount of agricultural land around the city that reaches almost to the great wall. Therefore, Alain only reports densities for cities that he and his wife, Marie-Agnes, have worked in and calculated themselves. He focuses on the density of built-up land, meaning land with buildings on it (whether those buildings are residential, commercial, industrial, or even abandoned). The graph below is a biased sample of population densities. It represents all of the cities that Alain and Marie-Agnes have worked in over their careers. While they may not be perfect (classification of land use from aerial photography always leaves room for some subjective judgment), any bias will be systemic because they are all produced the same way across cities.